Well it has been awhile but the holiday kind of got in my way so instead of starting a major project like weaving or getting all my beads out. I grabbed some excess yarn (which i have alot of) and decided to make me a lap blanket out of my favorite colors. 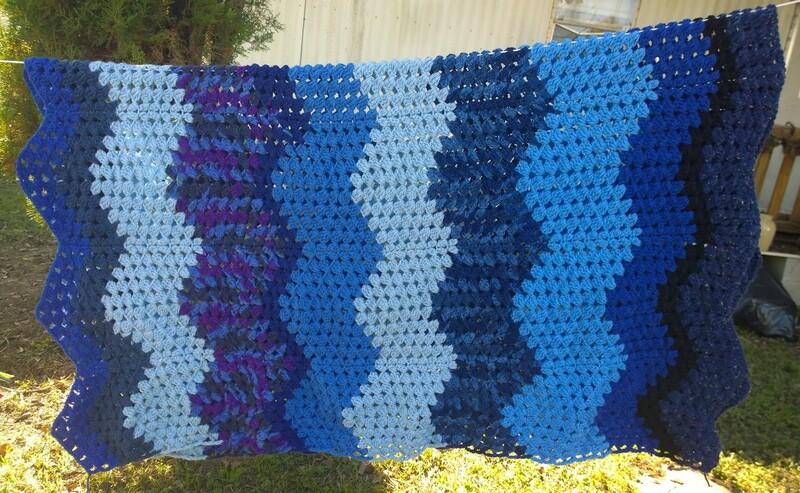 I love blue and most all the different shades of it and the pattern i have here is called a granny ripple. I have made a few other blankets using this pattern and it is really easy and you can do so many things with the colors for them. the first one i eer made was 30 years ago for my Mother-In-Law while i was pregnant with my oldest son and i fell in love with the pattern then, since then i have made alot more this being the latest one. I hope you like it and yes I can make one for you also, all you have to do is ask and we can talk about colors and price just contact me.